As a teenager, I used to watch television commercials, which portrayed the mother almost like a superhero who knows exactly what the entire family wants without anyone expressing themselves. I too aspired to be this superhero when I became a mother. However, I realized that it is not very easy, and it is definitely not possible to know everything. For centuries, society has stereotyped mother as the ultimate caregiver. This pressurizes them to believe that they should know it all. A mother reprimands herself if misses on a sign and is constantly gripped with the fear of failure and being judged. At times, the society fails to understand that we mothers too are normal human beings with our own limitations. There are times when we don’t exactly know when our children feel hungry or what therapy to follow when they have a stomach pain. We learn from our experiences, our surroundings, our mistakes and of course by asking others. So, if I am asking other mothers how to potty train my child, it does not show my ignorance, but my willingness to learn from other moms, who probably have been in my shoes and can share helpful tips. No one knows it all, and instead of criticizing the mother it is a chance for the family to support her in the journey of raising her child well. 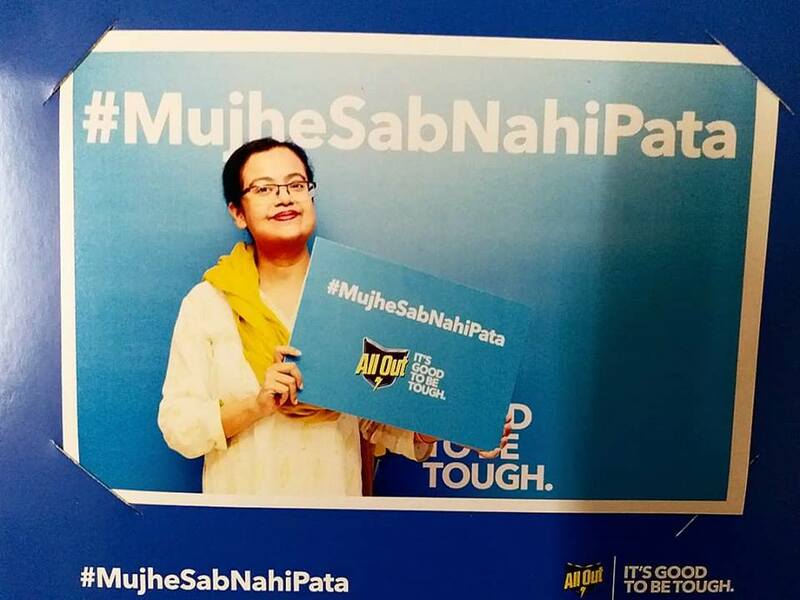 A short film developed by All Out for their #MujheSabNahiPata campaign- https://www.facebook.com/AllOutIN/videos/256425565275319/ has accurately captured a mother’s dilemma prompted by social pressures. A story that resonates with all moms, the film gives out the message that it takes a tough mom to admit that she doesn’t know it all. I could relate to the film as it reminded me of my own #MujheSabNahiPata moment. When my daughter had not begun talking till her 2nd birthday, I was held responsible and often judged as a careless mother, who cannot train her child well. I still recall that guilty feeling which clouded me all the time, making me doubt my capabilities as a mother. Though things have worked themselves out my daughter speaks fluently, I can’t help but wonder what went on in the minds of those who were quick to judge me. That helpless feeling when someone holds you responsible for something you didn’t know is certainly terrible. At a recent event organized by All Out for its campaign, noted personalities converged to discuss this standard social conditioning and the constant pressure that all moms go through in India. They delved into how in a constantly emerging world of threats, mothers often do not get a chance to pay heed to smaller things like a mosquito bite, which could cause a deadly disease like dengue. This is mainly due to her focus on bigger responsibilities. I was particularly impressed by the easy tips given by one of the panelists, pediatrician Dr Samir Dalwai’s which were focused around symptoms to watch out for e.g. is the child less energetic than usual, is he/she eating less than usual. Listening to noted actress Sonali Bendre, who is also a mom, share her motherhood journey and highlight the importance of the campaign and celebrate tough moms who admit #MujheSabNahiPata was a riveting experience. The audience which comprised of mothers like me were highly engaged in the conversation and participated by sharing personal anecdotes and their #MujheSabNahiPata stories. I was glad to meet like-minded people who kept judgment out of the room and gave me the courage to admit #MujheSabNahiPata without feeling guilty about it. This slogan really rings true and I am so glad that someone has had the courage to say it. Looks like it was a wonderful event. Its a very beautiful campaign. I guess you had a great time in that event. I wish even i could be present for that event. This is exactly what our society needs to know that we mums are also normal human beings and we should not be expected to know everything at all times. We can also have our aspirations and should be allowed to think about ourselves too. Great post Jhilmil. It makes me so much happy that you took part in this campaign. Mums are expected to know it all, buy why, they too are human and they can too make mistakes. I hate when they are judged if something goes wrong. Great initiative . I totally agree with you! We are normal human beings who become mothers and we do not know everything! Asking for help or ideas is great and a way to Learn! Amazing initiative! I agree..moms are humans too. They don't know everything and that's ok. Looks like a great event. Must have been a good experience. So much needed this in our society! Moms can’t be perfect and know-all all the times. They can make mistakes too. Great event it seems to be! Great to know that such campaign is there. Everyone wants to know that mothers have their life to live as well. This is an amazing initiative. So true moms don't know everything. Looks like you had an amazing experience there and I really like the hashtag. Oh wow! You got the chance to be a part of this campaign. This is true that I am a mom and I don't know all. We are also learning day by day as parenting is also changing day by day. I can relate at the time when my first baby was born, I faced so many challenges. I really feel proud to be a part of this beautiful initiative by ALL OUT and yes I too firmly believe that Mujhe sab nahi pata!! I love this initiative by ALL OUT. So much pressure on moms to be perfect and be happy all the time. This really looks like an amazing event where every mom would have felt validated! Oh, i totally understand but sadly my family has not yet understand all these!! It is so good to let mothera finally accept without guilt that they cannot know it all. Must've been a good event! This is such a nice initiative by All out. All moms are expected to know everything and often they are held responsible for the slightest thing that happens to a kid! Some people also need toc hange their mentality. This is such a great initiative to be very honest. We moms are also human beings and we don't know everything. We are human not machines,so how can we know all. Kudos to the organiser who has come up with such amazing concept. Internationally,Hermes handbags Luxury is defined as "a kind of consumer goods with unique, rare and rare characteristics beyond the scope of people's survival and development needs", which is also known as non-life necessities. In economics, luxury refers to the product with the highest value/quality ratio.From another perspective,Replica Breitling luxury goods refer to products with the highest ratio of intangible value to tangible value.In the English dictionary, Luxury means Luxury and Luxus.Swiss watches Luxus was a Latin word for "great fertility", which became wasteful and unrestrained.Most European languages have adopted the concept, which is, to be exact, used to describe certain aspects of expenses and lifestyles that go beyond the necessary level in the production and use of various commodities.? There is no shame at all in accepting that us mothers don't know it all. We are human too and to err is human.